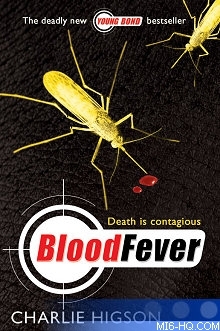 Following the huge success of the first Young Bond book, SilverFin, Puffin Books and Ian Fleming Publications are delighted to reveal the title and jacket image for the second book in the series, BloodFever, which will be published on Thursday 5th January 2006. The book is by the much-acclaimed author of SilverFin, Charlie Higson. SilverFin, which was published in March this year, has sold 125,000 copies in the UK alone, and was in the Top Ten of the Children's Bestseller lists for 11 weeks. In the book, readers are introduced to a 13-year old James Bond, who gets involved in an evil plot in the Scottish Highlands while in his first year at Eton. BloodFever is set largely in Sardinia, where James is spending his summer holidays, and features, in Charlie Higson's words, "pirates, bandits, art thieves and a shoot-out in a cave; everything you could want from a James Bond book." It is the second in a planned series of five Young Bond books. The book jacket was revealed earlier this morning on the official website, www.youngbond.com. The Young Bond series has been commissioned by Ian Fleming Publications, owners of the James Bond literary copyright. Francesca Dow, Managing Director of Puffin, said: "We are delighted with the success of SilverFin and anticipate a huge second bestseller in BloodFever. Gritty, action-packed and villain-ridden - it is unputdownable."